Billed as the “ultimate party with a purpose,” Girls’ Night Out is up to great good again. Proceeds from this year’s extravaganza, founded by Fox 5 anchor Shawn Yancy, will benefit Safe Shores and the Ivy Foundation. 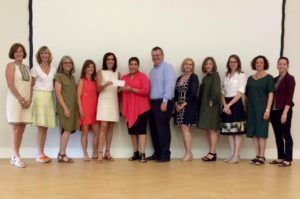 Since 2010 when GNO launched into action, the event has raised money and donations for charities that make life better for women and children in the DMV area. Protect Kids #365 this summer – including at camp and summer programs! As summer is well underway and children are immersed in their summer camps and activities, Safe Shores encourages parents, guardians, and mentors to inquire about the abuse prevention policies and education of these summer programs. A simple phone call is all it takes to ask if staff and administrators have been trained to recognize signs of child abuse. 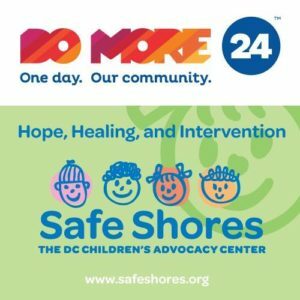 If programs do not have a clear answer about their prevention work, encourage them to join Safe Shores for an upcoming Stewards of Children® sexual abuse prevention training (or to work with our Prevention and Outreach team to hold a private training). Safe Shores has already trained more than 600 adults with prevention trainings this year alone. It is up to adults to shift the culture of silence around abuse and to ensure that education is the first form of prevention in order to #ProtectKids365. Safe Shores welcomed members of Many Hands to graciously receive their $100,000 annual grant, which will be used to to reach thousands more adults and children with child sexual abuse prevention training and to help youth-serving institutions develop and implement meaningful child protection practices Many Hands is a women’s grantmaking organization committed to making a lasting impact on the lives of DC area women, children, and families in need. 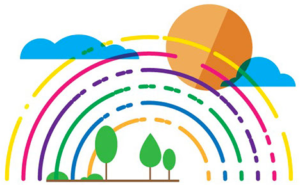 Teaching people and affecting policies around abuse will have a direct and transformational impact on the lives of thousands of adults, tens of thousands of children and, in turn, on the lives of generations to come. Welcome to our new Deputy Director, Twana S. Sherrod, LICSW! 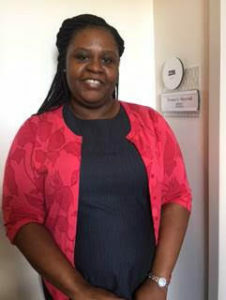 Twana S. Sherrod, LICSW joins the Safe Shores team with more than 15 years of training and experience in serving children, youth, and families and the supports that influence them. She is committed to intercepting intergenerational cycles of trauma and has collaborated with government and private entities to ensure that functioning systems are established for meeting the needs of our most vulnerable groups. Twana holds a Bachelor’s degree from Emory University, a Master of Science degree from Columbia University School of Social Work, and an Executive Master’s degree from Georgetown University McDonough School of Business. Safe Shores’ 2017 #Pack2School Drive! Safe Shores’ #Pack2School Drive has officially begun! 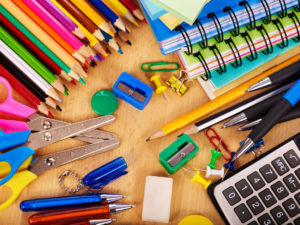 This year we are trying something different to ensure children affected by abuse begin the year with the supplies they need to head back to school in the Fall. #Pack2School supporters can either sponsor a backpack (or several backpacks!) 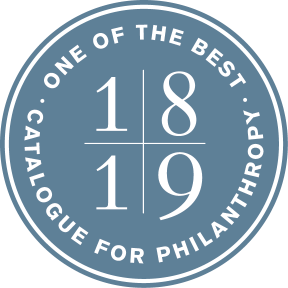 filled with grade-appropriate items for each child or supporters can make a donation so that Safe Shores can purchase supplies for children in need. Visit our site to fill out a donor sponsorship request form and to get more information on our drive! In the wake of allegations that a Charles County, Md., teacher’s aide and coach sexually abused several students, WHUR-FM/HUR Voices called on Michele to provide expert advice on how parents, schools and the community can protect kids from sexual abuse. 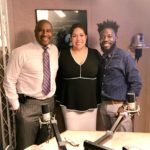 Pages Matam, an adult survivor of child sexual abuse and an award-winning slam poet, joined Michele in the conversation that aired live on July 6. There’s an artist in everyone and #SantaCause, a successful social media campaign founded by D.C. rapper/philanthropist Mo Betta, invites you to tap into your artistry at Art in the Afternoon, a fundraiser to benefit Safe Shores. 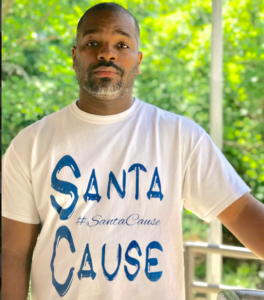 Last year, #SantaCause raised more than $35,000 for Safe Shores. This year Mo Betta has upped the bar, seeking to raise $50,000 to support Safe Shores’ work and mission. Art in the Afternoon promises to help #SantaCause meet its new fundraising goal, as 40% of all ticket sales will go to Safe Shores. Safe Shores is collecting books! 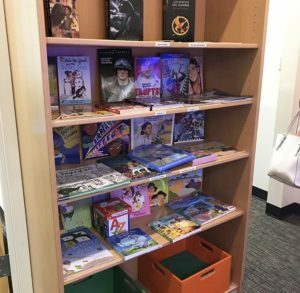 Reading books is a huge part of staying engaged and retaining knowledge throughout the summer and continues to be a huge need as kids head back to school as early as August. Safe Shores is collecting books for the children and adolescents that come through our center. You can see the list of titles by clicking on our Amazon wish lists under the middle school book drive or high school book drive links. In honor of Child Abuse Prevention Month, clothing retailer Eloquii hosted an evening of shopping on April 27th at the location in Pentagon City Mall, raising nearly $1,000 to benefit Safe Shores. 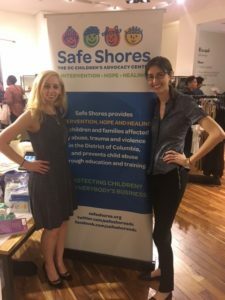 Attendees of the event were able to shop for a cause while learning about Safe Shores’ work through a live interview between ABC 7 News – WJLA’s Poet Taylor and Safe Shores’ Executive Director, Michele Booth Cole. Special thanks to Eloquii and Poet Taylor for helping us raise awareness about child abuse and challenging everyone to #ProtectKids365.